Ex-Facebook CTO’s new app Quip releases new features, including expansive search | Promoción Viral. 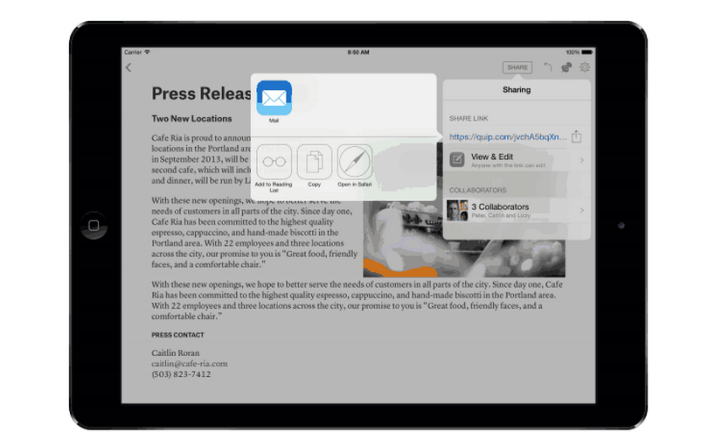 Quip, a mobile-focused, collaborative word processing app co-founded by former Facebook (s fb) CTO Brett Taylor, released a new version on Thursday for iOS (s aapl), Android (s goog) and desktop that incorporates feedback the company has received since it launched in July of 2013. The main draw of Quip is that it is a self described “post-mobile” processor — working directly in the cloud and built for collaboration. Its cross-platform approach, which it has had from launch, means that companies can work and collaborate on documents, even with a BYOD system in place. Secondly, it incorporates a chat feature, designed in the vein of other corporate chats like Slack or Yammer, to keep collaborators in the loop.